The Craft Brew Alliance issued its Q4 and overall 2018 financials the other day. There's good news and bad news if you absorb the full report. Mostly, though, the numbers paint a fairly positive picture of the CBA's position moving forward. The bad news in the report, which I shall get to, apparently cooled investor interest in the CBA. Its stock price opened the week at over $17 and closed Friday just above $15. Investors may be missing the boat. Because there's a chance the CBA will be gobbled up in its entirety by Anheuser-Busch at $24.50 per share by next August. Much of the CBA's good news relates to Kona, which grew 8 percent for the year, 11 percent during Q4. There's a bit of bad news associated with that growth, which is that Kona made up 63 percent of the CBA's total shipments. It's a little scary to be so dependent on one brand, although Kona is thus far proving itself to be immune from the fragmenting, flattening craft market. The bad news involves the CBA's problem child brands, Widmer and Redhook. The former declined 20 percent, from 123,300 to 98,700 barrels. The latter lost 24 percent, from 94,200 to 71,200 barrels. Imploding sales of Widmer Hef and Redhook Longhammer IPA and ESB were identified as the primary reason for the decline. The two legacy brands, once strong growth engines, are losing the competitive battle in a market increasingly driven by smaller local breweries. Despite the continued success of Kona, total CBA shipments, including beer produced under contract at its facilities, declined by 700 barrels, to 747,600 barrels in 2018 versus 2017. Nonetheless, net dollar sales increased 1.3 percent, to $182.2 million, the result of stronger pricing. Total net sales were $206.2 million, a 1 percent decrease from 2017, primarily due to a $3.4 million shortfall in contract brewing fees received from Pabst in 2017 that did not recur in 2018. The decrease also reflects lower 2018 pub sales, mainly due to the absence of the Woodinville pub, which was closed at the end of 2017. As part of its agreement with AB, the CBA can brew up to 300,000 barrels a year at AB's plant in Fort Collins, Colorado at a net savings of $10 per barrel. They evidently came closer to realizing the $3 million in annual savings that arrangement could have brought in 2018. Partially as a result of production shifted to Fort Collins and other AB factories, capacity utilization at CBA facilities declined to 57 percent over the last two years. That's a lot of underutilized tank space and it happened despite the fact that Goose Island beer and Virtue Cider is being produced by the CBA in Portland and Portsmouth. Like its parent-apparent, the CBA is fixated on cost cutting and improving gross margins.Through strong revenue and rabid management, it delivered a 2.6 percent increase in total revenue per barrel, which led to a 5.6 percent improvement in beer gross profit and record full-year beer gross margin of 36.8 percent. Finally, shipments of the Omission, Square Mile Cider, Appalachian Mountain Brewing, Cisco Brewers, and Wynwood Brewing families grew by a combined 4,700 barrels to 93,200 barrels. That portion of the CBA’s portfolio now accounts for some 13 percent of total shipments. What the CBA has effectively done by leveraging its arrangement with AB and aggressively tightening up underperforming aspects of its business is improve its position for the future, regardless of whether it becomes a fully-owned subsidiary of Anheuser-Busch. Investors, for the moment, appear to be too fixated on the bad news in the 2018 report to see that the prospects of a buyout at $24.50/share remain quite strong. CEO Andy Thomas set an aggressive tone in comments made during the conference call, reminding shareholders that the CBA position is strong even if the possible takeover by AB doesn't happen. In the absence of a qualifying offer, he noted that the CBA will be entitled to a $20 million international incentive payment and AB could not terminate any part of the current agreement. Further, Thomas went on, if AB fails to make a qualifying offer, CBA could continue to operate independently or come under the control of another entity. In either case, AB would be required to honor all agreements, including payment of the $20 million international incentive, continuation of the master distribution agreement at $0.25 a case, continuation of the international distribution agreement and fulfillment of the contract brewing agreement. It's difficult to fathom the extent to which the current contract, signed in 2016, favors the CBA. What were the folks at AB smoking when they signed a deal that would allow the CBA to be taken over by another entity while Anheuser-Busch is forced to fulfill the terms of the agreement? The likely answer is the people who negotiated the agreement believed the CBA would be purchased during its term. There can be no other explanation. Of course, the craft beer landscape has changed dramatically since the 2016. Competition is fierce and most large craft breweries are suffering. Yet Anheuser-Busch recently reported that the High End (craft line) is its top growth engine, accounting for 30 percent of the company’s worldwide revenue growth and 10 percent of its total revenue in 2018. Why would AB want or need the CBA? The answer is Kona, which continues to thrive in a flat overall market. Keep in mind that Kona beers, unlike some of craft's more nuanced offerings, can be brewed virtually anywhere, even in a factory brewery. Acquiring Kona, of which AB already owns nearly a third, would cost around $300 million. That's pocket change for a brand that has apparently unlimited potential. Flies in the ointment are the CBA's declining brands, Widmer and Redhook. Anheuser-Busch, should it make a qualifying offer, will have no interest in salvaging those brands. They might be killed or sold in a buyout. In fact, you have to wonder what would become of CBA properties in Portland and Portsmouth. Those breweries, not as big or efficient as AB's giant factories, might well be closed and sold in the wake of a buyout to recoup some of the investment in Kona. Inquiring minds keep asking what's so special about Kona. In my mind, there's nothing particularly special about any of the Kona beers. But Kona is a lifestyle brand with a strong connection to a place consumers identify with. 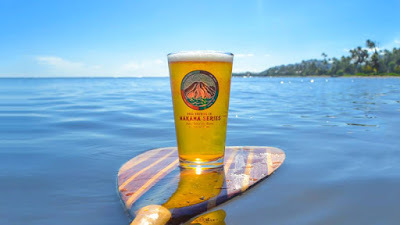 It hardly matters that Kona beers have been brewed in Portland and elsewhere on the mainland for years. The brand is Hawaiian. Honestly, there's a lot not to like about the CBA, an organization whose leaders appear to be fixated on numbers. This company ceased being about craft beer long ago. By cutting costs and leveraging their agreement with Anheuser-Busch to the hilt, executives have positioned the CBA to be bought lock, stock and barrel. The chances of that happening look to be better than 50/50 from here.